Hi everyone! We are pleased to have Frank J. Tassone as our guest pub host for this week’s Haibun Monday. Good Afternoon, Poets! Frank J. Tassone here, hosting this week’s Haibun Monday. For those that don’t know, haibun is a form of Japanese poetry that combines prose, or prose poetry, with haiku. And what better topic could there be today for a haibun than Hiroshima Day 2018? …Remembering the 140,000 irreplaceable human lives that were lost, either on the day of the bombing or in the ensuing months, and the numerous atomic bomb survivors who still suffer from its aftereffects even to this day, one cannot help but be left with a strong sense of the horrors of nuclear weapons and a strong hope for world peace in one’s heart. Let us commemorate Hiroshima Day with our own poetry! This week, I want you to write a haibun that states or alludes to either the Hiroshima attack, or one of the themes of the Hiroshima Peace Memorial Ceremony, such as peace, the abolition of nuclear weapons, or the horror of nuclear war. Remember to click the small checkbox about data protection. Frank J. Tassone is a writer, a teacher, a husband, and a father. He fell in love with writing ever since his wrote my first short story at the age of 12 and his first poem in high school. His free-verse has appeared in the literary e-zine Pif. His haibun has been published in Failed Haiku, Cattails, Haibun Today, Contemporary Haibun Online (CHO) and Contemporary Haibun, CHO’s annual print anthology. He is honored to be a part of the Image Curve community as a contributing poet. He is also happy to be a performance poet with Rockland Poetry (formerly Suffern Poetry) in Suffern, NY. He has worked as a special education teacher in New York City High Schools for the past twenty-one years. He lives in Montebello, NY with his amazing wife, Mira, and their beloved son, Frank. When not writing, He meditates, hikes, practices tai chi and geeks out to Star Wars and Marvel Cinema. Appreciate your perspective and personal share Bjorn! Same here. It took me a while to relate to the prompt but, as today is also the anniversary of my father’s death, I kind of linked it to a memory from childhood and it developed from there. Thank you, Frank, for the prompt, and I hope everyone has had a good start to the week. As well as thinking about my dad, I also had to say goodbye to my daughter and grandson. We had a wonderful day yesterday: during the day we went to the seaside and, in the evening, we watched The Pantaloons’ performance of Shakespeare’s As You Like It on our village green. Such a lovely day/weekend you had Kim. We are on a extended weekend as today is our holiday. Have a great holiday, Grace! Thank you for reminding us of this special day for peace Frank! Happy Haibun Monday everyone! Iced wine for me. It was a hot day today but now it is raining. Thanks for being our host Frank! My pleasure, Grace! Iced wine coming right up! I like lemonade much better! I am not into wine that much. What a special and challenging prompt, Frank. Thank you. A meaningful topic (for the last 73 years) and stunning haiku in this post. Thank you. What a prompt Frank! You bought back a memory I had buried. Thanks for this prompt, Frank. I am enjoying all the different angles, emotions, and ultimately hope expressed here. My thanks to all of you who participated. I am so moved by the beauty and passion you showed in crafting all of these wonderful haibun! Looking forward to more tomorrow! What a topic..I thought I couldn’t . But I did. It’s something we all need to think about. Thankz for hosting Frank. Thank you Frank, for reminding us of this special day. I had to really think about how to even connect with this — since the prose in haibun cannot be fiction. Then my husband reminded me of our visit to the Air and Space Museum and seeing the Enola Gay. May we never use this power again. Indeed. I liked how you used your visit to the Air and Space Museum as a springboard into the Hiroshima experience. Thank you, again, for sharing! That’s a very thoughtful prompt. Thank you. 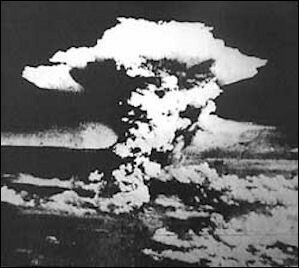 The thought of Hiroshima on this rainy day turned out to be quite evocative – like others, I couldn’t deal or relate with the enormity of the incident unto itself. So, I just wrote about the mood it evoked. Thank you for brining this history up to reflect upon. It is so important to remember the mistakes of our past.